Here we are on Day 6 in Granada This is a bustling modern city in southern Spain. 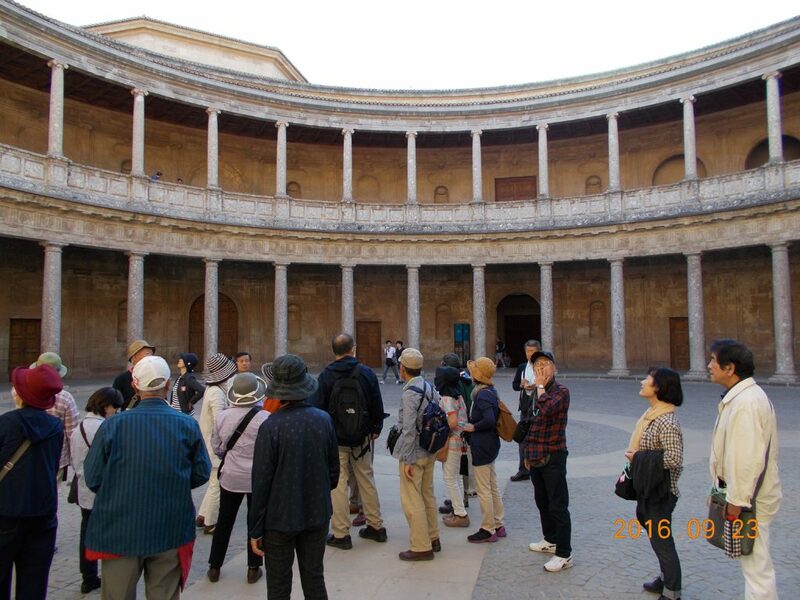 It is the home of the Alhambra, our first stop. 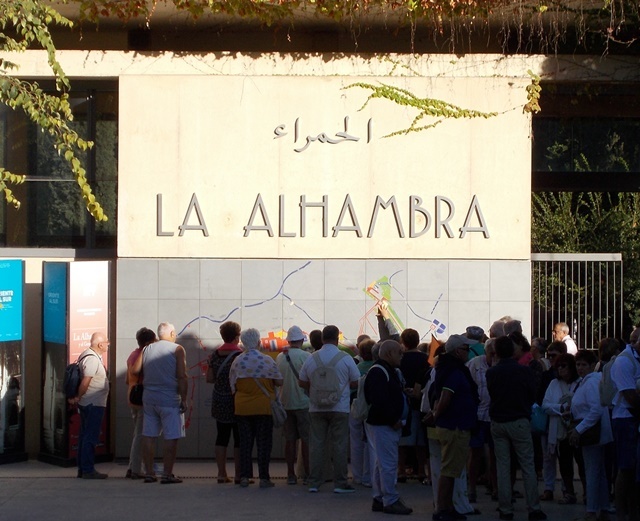 Here is our Alhambra guide. I apologize for not having her name. 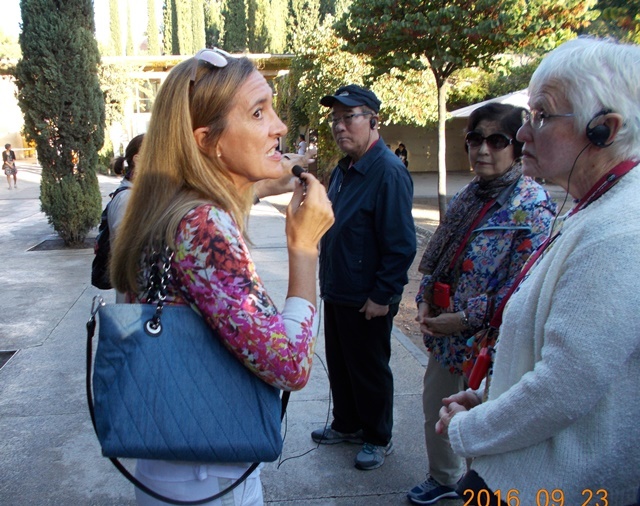 She was a really super guide! Note the device she is talking into and the devices in the ears of the listeners They are “Whispers” and they are great . 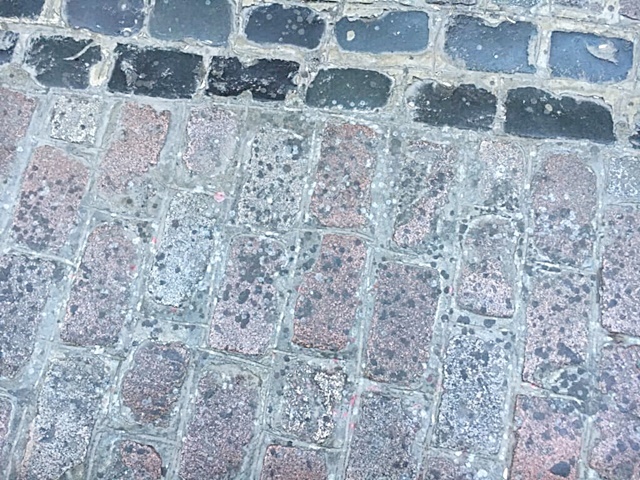 The guide can talk and be clearly heard 50 or more feet away. Here’s the entrance. The tickets are timed so we had to wait our turn. They are also very expensive, but Juanjo got us the senior discount! Here’s what it looks like from the GCT drone. The building on the right with the circular open roof is the Palace of Charles V.
This is what the Palace of Charles V looks like from the outside The 16th-century palace has the distinction of being one of the first Renaissance buildings created outside of Italy, modeled on Florence’s equally massive Palazzo Pitti, and its architect, Machuca, was a student of Michelangelo in Rome. The design is monotonous and massive, much like many ministerial buildings one sees throughout the world. It is mainly distinguished by its circular courtyard, in the majestic Roman tradition. I think there were plans to roof the courtyard like the Pantheon in Rome. I don’t think this building is an active palace, but it’s impressive! 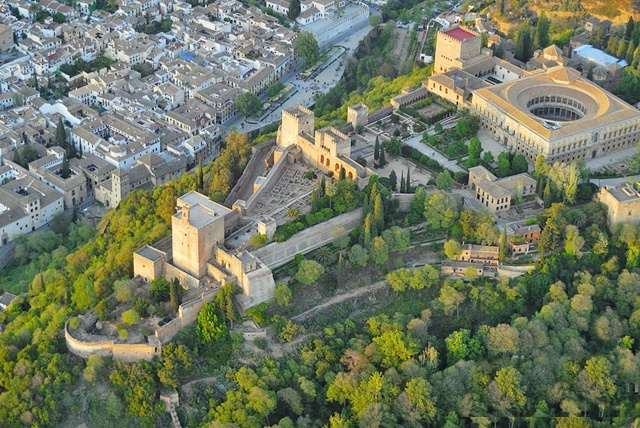 The Alhambra (AKA the Red Palace) is a palace and fortress complex. It was originally constructed as a small fortress in AD 889 on the remains of Roman fortifications, and then largely ignored until its ruins were renovated and rebuilt in the mid-13th century by the the Emirate of Granada, who built its current palace and walls. 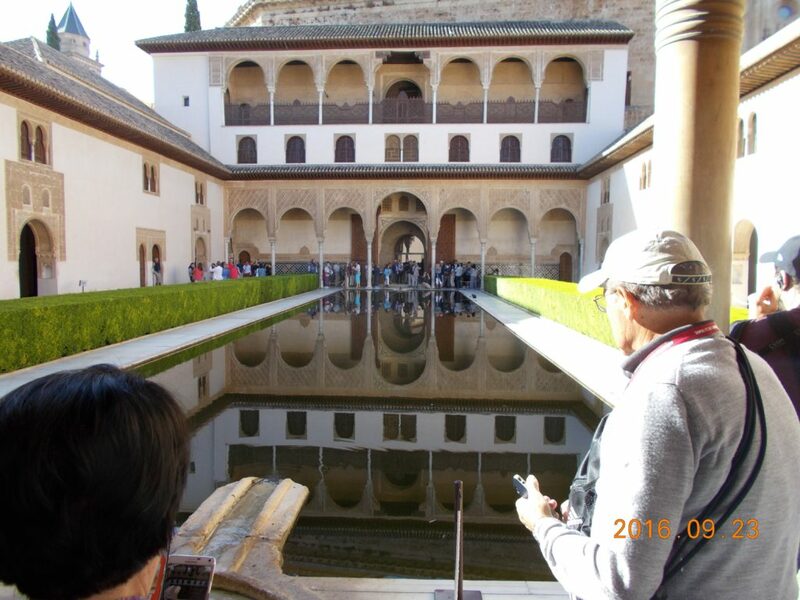 There are numerous rooms and courtyards with fountains and reflecting pools and gardens in the Palace. Here are a few of them.This courtyard has a Ladies Balcony where the ladies could view the activities (men?) below without being seen. 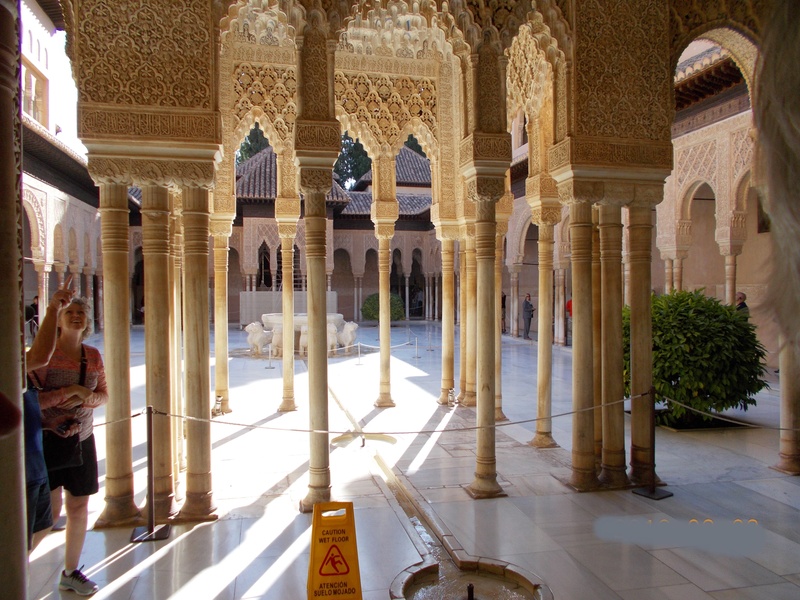 This courtyard still has Moorish columns and a fountain. Note the water channel to drain a fountain. 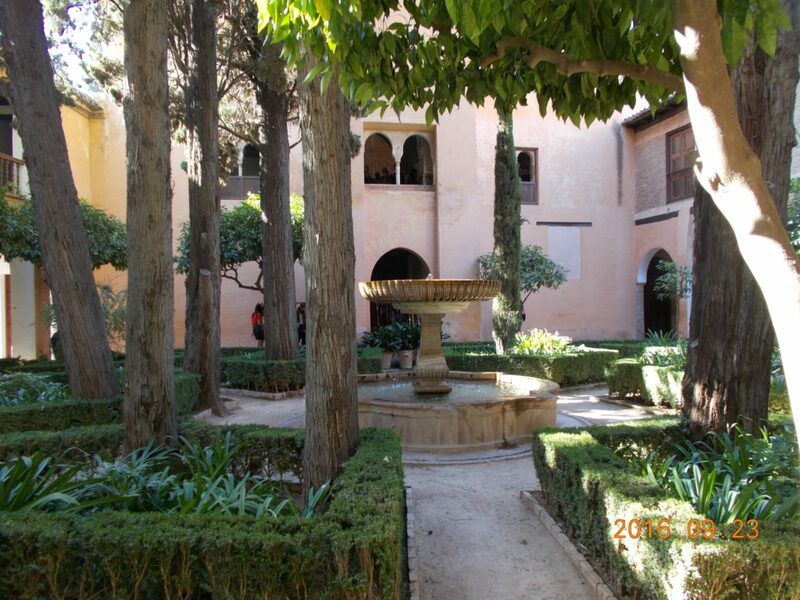 Here is a quiet, shady, treed garden in another courtyard. 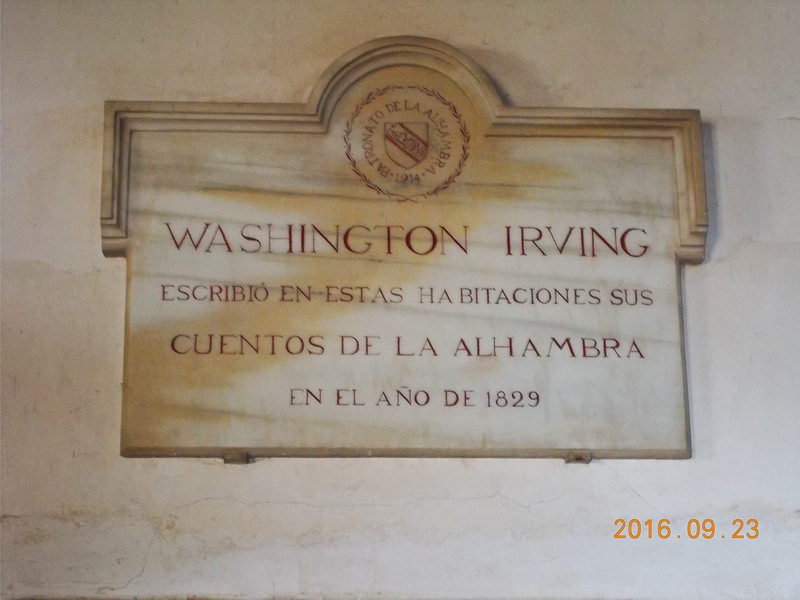 Washington Irving, the American author lived here when he wrote his “Tales of the Alhambra” in 1829. 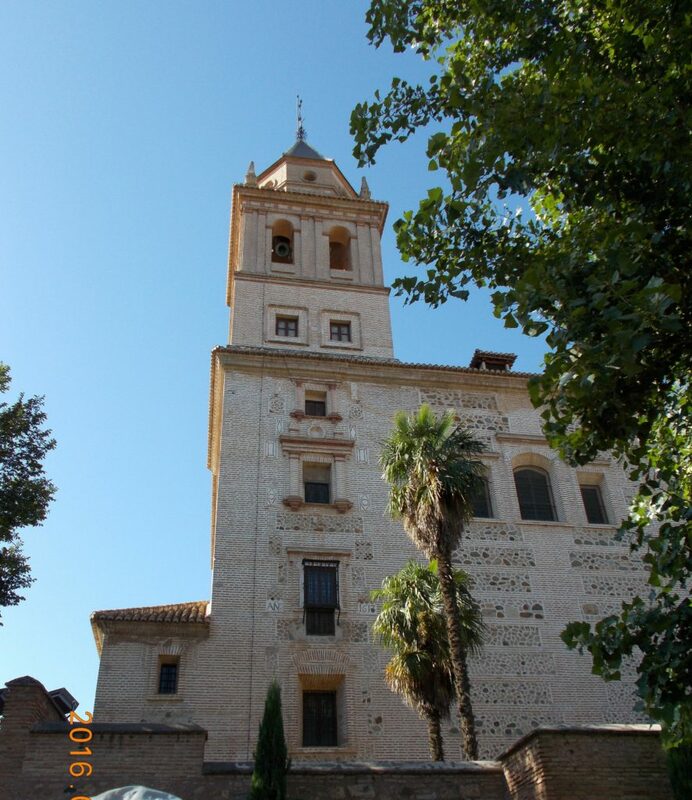 One final picture of the Alhambra: This is the Church of Santa Maria. 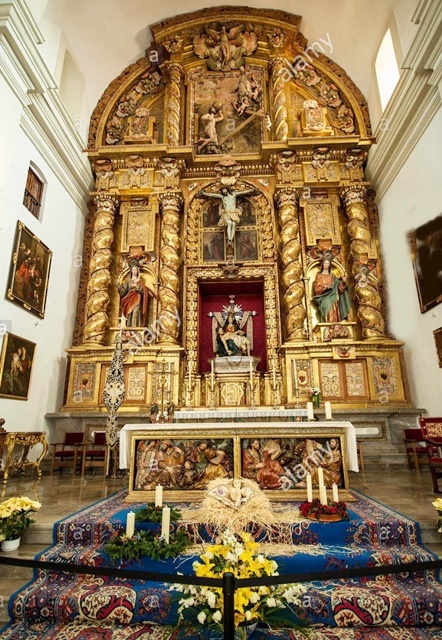 This is a “simple” parish church. But, the altarpiece has a wonderful representation of the resurrection, with Jesus springing joyfully from the grave carrying a redeemed world to his father. We left the Alhambra and returned to downtown Granada just in time for lunch. On the way out I spotted this Parador. Paradors are Government sanctioned Inns that are located in historically significant. 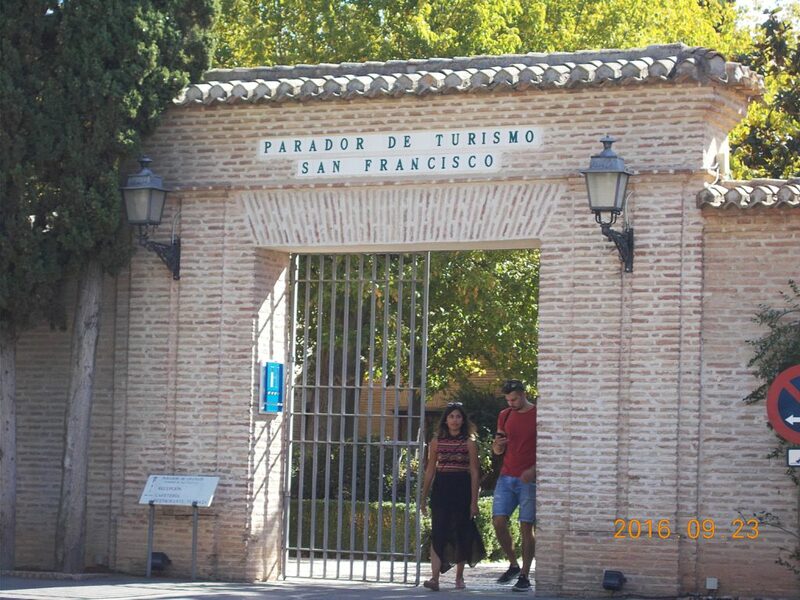 The Parador Granada is part of a palace and mosque built between 1332 and 1354 which was later converted into a Franciscan convent with a charming tiled patio remaining from this conversion. We had lunch in a small local restaurant. Normally this place would not be opened until later, but Juanjo knows that we Americans like to eat lunch at noon so he took over the whole place. Our choices were beef or fish. I had beef and it was super. I think we had flan for dessert. While we were eating a group of musicians arrived. 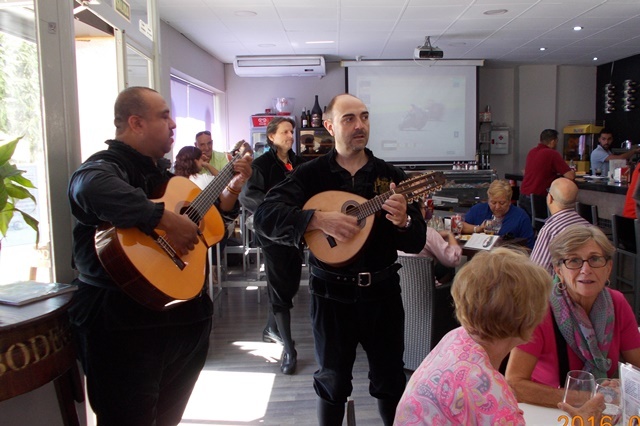 They were Spanish Tuna Musicians (not the fish type). A tuna is a group of university students in traditional university dress who play traditional instruments and sing serenades. The tradition originated in Spain and Portugal in the 13th century as a means of students to earn money or food. Nowadays students don’t belong to a “Tuna” for money nor food, but seeking to keep a tradition alive, for fun, to travel a lot and to meet new people from other universities. 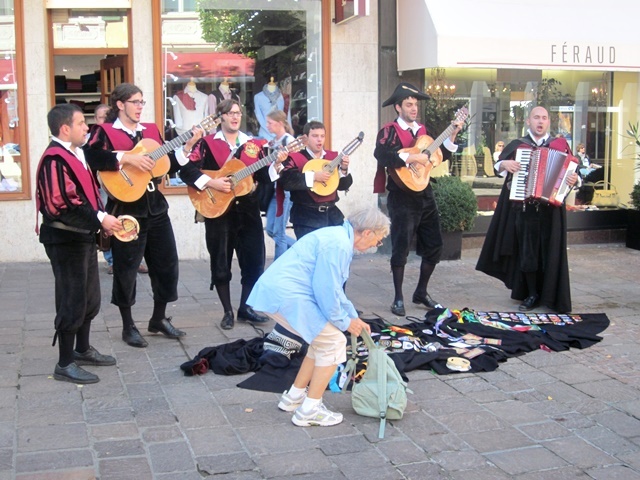 This is the Salamanca University Tuna group performing on a street in Heidelberg, Germany on a previous tour with my wife and me. Note their capes, pantaloons, caps and blouses: 13th century outfits. 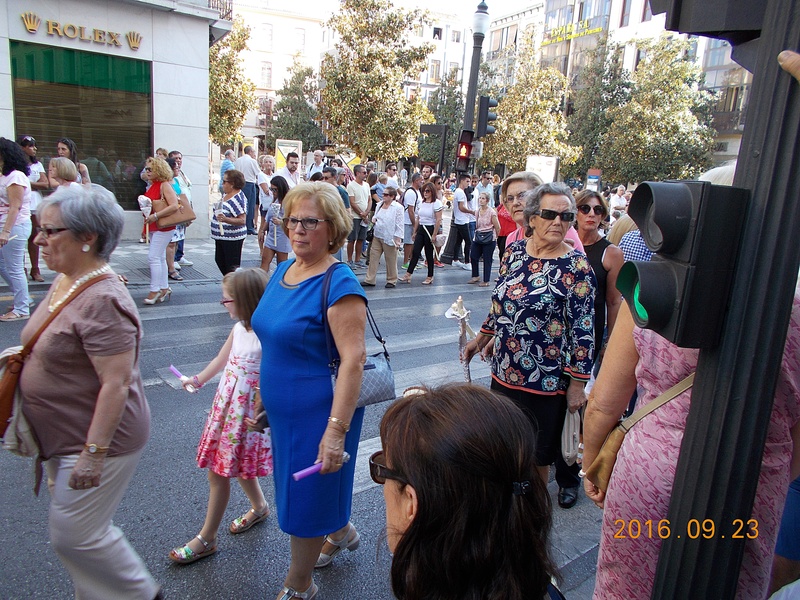 On the Gran Via in Granada is a marble statue. 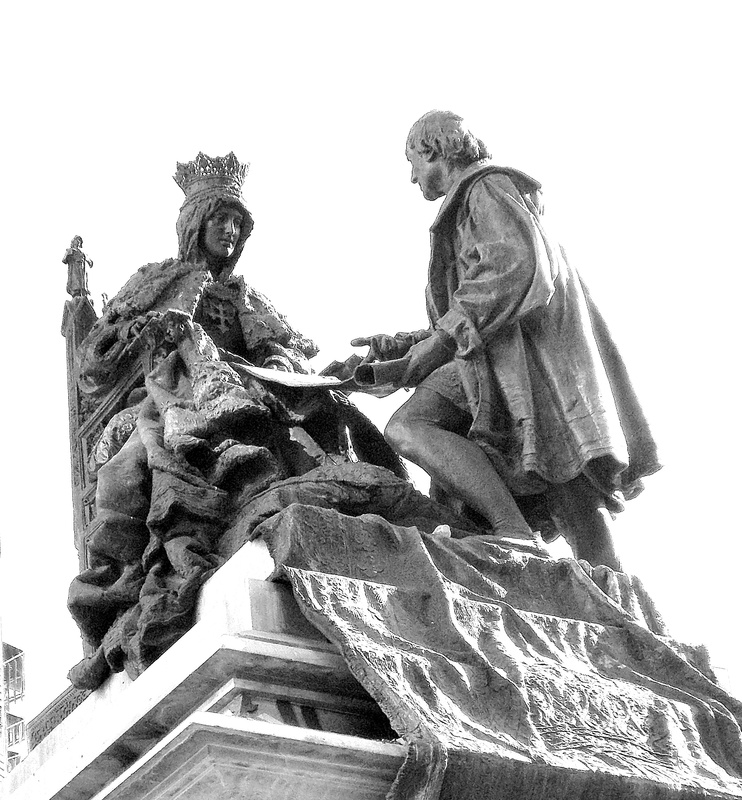 It represents Queen Isabel giving Columbus her permission to make his journey, and was sculpted in Rome for the Fourth Centennial of the Discovery of America in 1892. The official name is Plaza Isabel la Catolica, but the Granadinos amusingly call it La Plaza de Colon- Columbus Square – since there’s no doubt in their minds that the real hero was the sailor and not the Queen, who merely signed the chit entitling him to obtain the ships and supplies. We ended up walking in the “Old Town” and stopped at a church. Many in the group chose to pay and go inside. 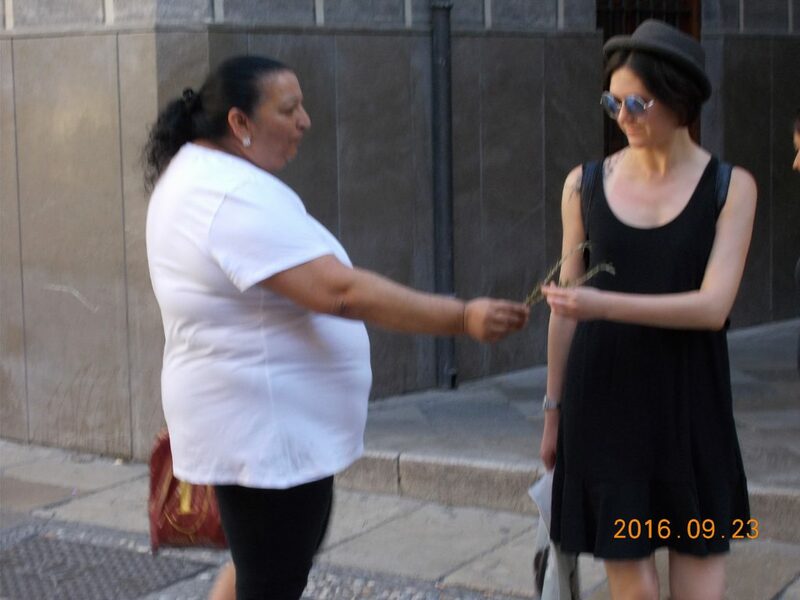 I stayed outside watching the Gypsy panhandlers approach tourists offering a small sage sprig. If you accepted the sprig, you wee obligated to pay. If you didn’t pay. there would be a big scene until you did. You’ll notice that the date stamp year on this and other pictures is wrong. I didn’t set up my new camera correctly. This guy was a “Seat Vendor” who had many, many folding chairs lined up along the street, You would pay him some money and he’d give you a ticket your the seat. He would then check to see if all the seatees had tickets. He’d throw you out if you couldn’t produce his ticket, “No tickee, no seatee!”. Note the wax on the street it was just the beginning! Here is a peek of one of the six or more marching bands. They playeda slow somber march with a lot of bugles and deep drums. 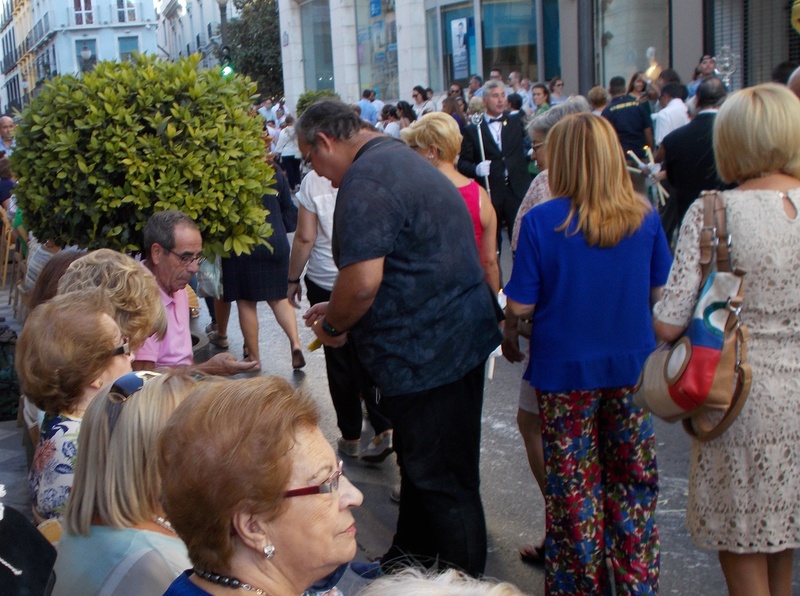 The street had gotten so crowded that they had trouble keeping together. 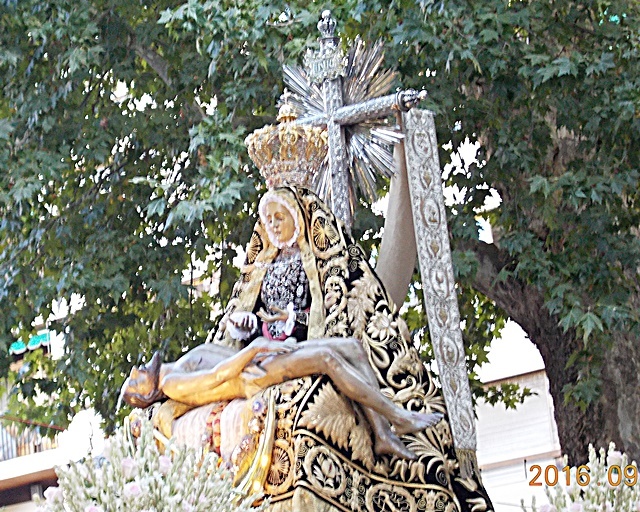 The subject of the procession was this Pieta. I could barely make it through the crowd to get this picture. There were now thousands of people crowding together and there were fireworks going off. 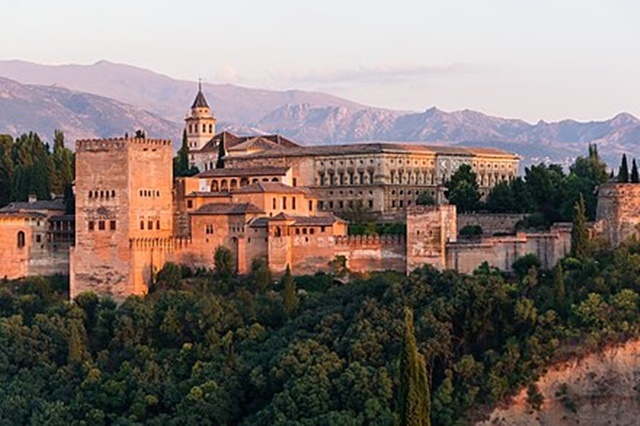 There is one more special claim to fame by the provincial capital in that no where else in Andalucia can you experience Semana Santa with the Alhambra in the background. 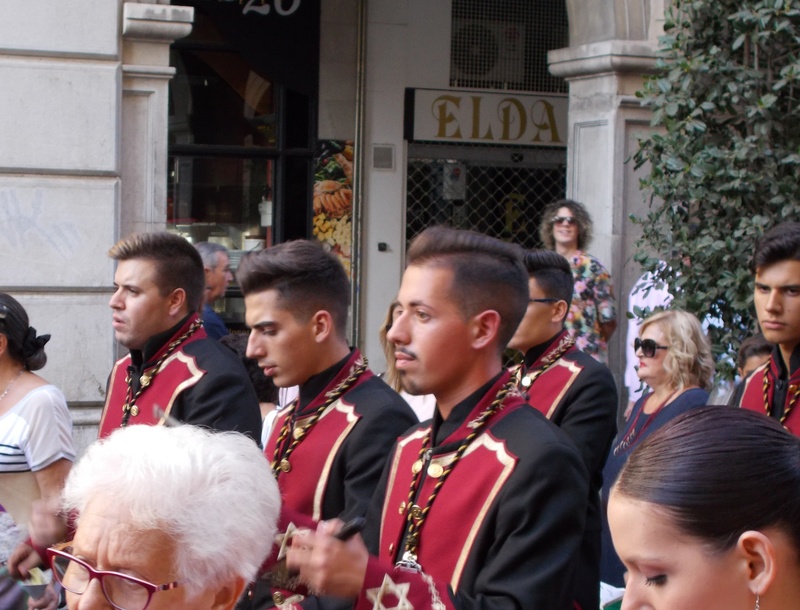 In Granada city there are more than 30 Catholic brotherhoods and they organize processions, some with works of art – in the forms of Jesus and Mary – that they carry about the city date back to the 14th century. Later pieces belong to the 16th century. I finally had to get away. The noise and the crowds were overpowering. This is what the street looked like the next morning. And so to bed after a long busy, noisy Day 6.